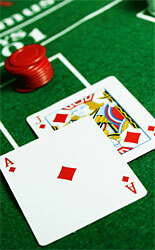 The Hi-Opt II (also known as High Optimum 2) is a balanced card counting system for advanced blackjack players. This method possesses the pro level of complexity degree. It takes more time to get used and mater this technique and still provides the player with high odds for winning. If you decided to become a professional blackjack player then you should get acquainted with Hi-Opt II method for sure. This is a well-known and more advanced version of Hi-Opt I system. One more advice - learn and practice the Hi-Lo or KO counting systems first and only then step the Hi-Opt II card count technique. Not out of place to remind the fact that the card counting systems employment is obligatory accompanied with basic blackjack strategy usage. The main differences between the Hi-Opt I technique and the Hi-Opt II card counting method lay in 2 count value (both positive and negative) for some of the cards. And we may state that it's much complicated to follow the traces with +2/-2 probability than with standard +1/-1 counts. Another difference between the given methods are 7 and 2 point cards which are counted in High Optimum 2 card counting system (by-turn in Hi-Opt I technique these cards count nothing). It must be mentioned that both systems are balanced. Thus you start the deck count with 0 point as well as you finish the deck count with the same 0 point. As we see the mechanism is quite complicated to follow and especially practice. And that's why it is truly believed that the High Optimum 2 card counting system is created for pro players, with cool heads and huge concentration. The Hi-Opt II card count technique possesses the Ace count nothing as a must. But it's not the whole truth. You don't count them but you must follow their departure in order to correct your basic blackjack strategy chart consistently.